ArchitectureConnections: Architecture & Art Museums: Art or Architecture? 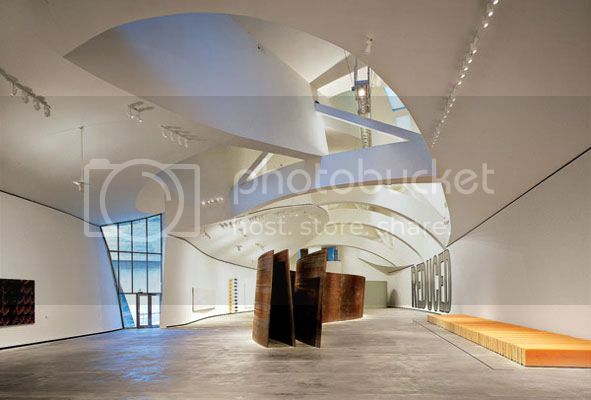 Architecture & Art Museums: Art or Architecture? Leonardo's Last Supper and Michelangelo's Sistine Chapel are both well know examples of works of art that have been viewed by millions. But public access to great works of art is a relatively new phenomenon. Until the modern era most significant collections of art were commissioned by religious institutions or wealthy patrons, and were normally housed in religious facilities or private residences. On rare occasions the collections may have been open to the public for viewing but this was the exception rather than the rule. 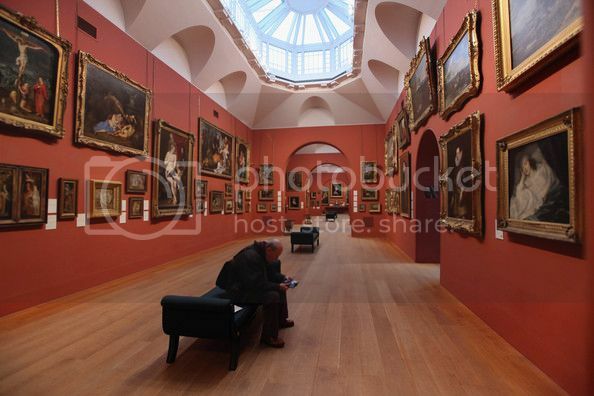 In 1817 the Dulwich Picture Gallery was opened in England. 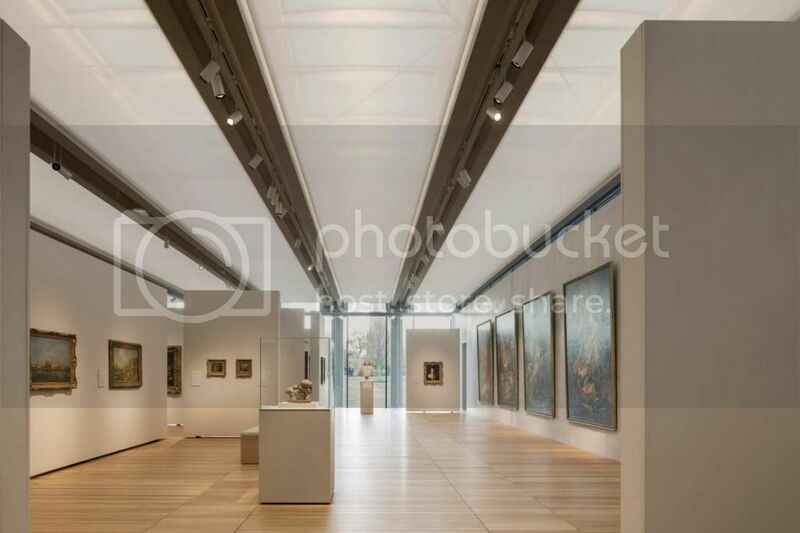 It has the distinction of being the oldest public art gallery in England and it ushered in a new building type - the Art Museum. The building was specifically designed to display artwork, where visitors traversed a series of gallery spaces containing long expanses of walls for hanging art. The location of windows and skylight were carefully considered, due to their impact on the artwork. This prototype was largely followed throughout the 19th and early 20th centuries, with the building serving as a backdrop for the art. 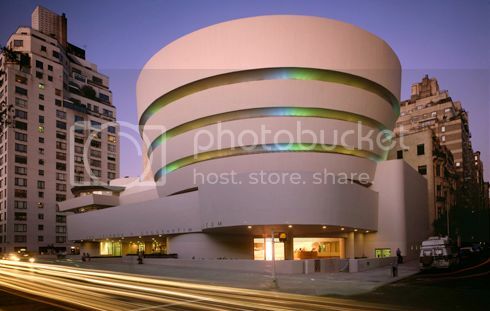 This began to change with Frank Lloyd Wright's last major work, the Solomon R. Guggenheim Museum, which opened in Manhattan in 1959. Wright designed a museum in which visitors entered a grand multi-level atrium space, proceeded to the top via elevator, and spiraled down by way of a continuous ramp. The art was placed on the spiraling outside walls and viewed from the sloped floor of the ramp. The artwork, when hung plumb, appeared askew. This was a major point of contention throughout the design process. 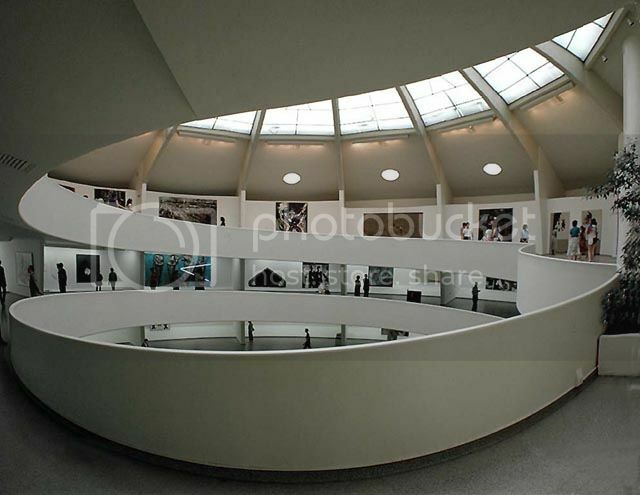 Baroness Hilla von Rebay, the Guggenheim's director, felt that this approach placed more importance on the architecture than the artwork it was meant to exhibit. Wright did not argue this point. He simply stated that "architecture was the mother of all arts", implying that the architecture need not be subservient to the artwork. Ultimately Wright proved to be the more stubborn of the two and his design was realized. 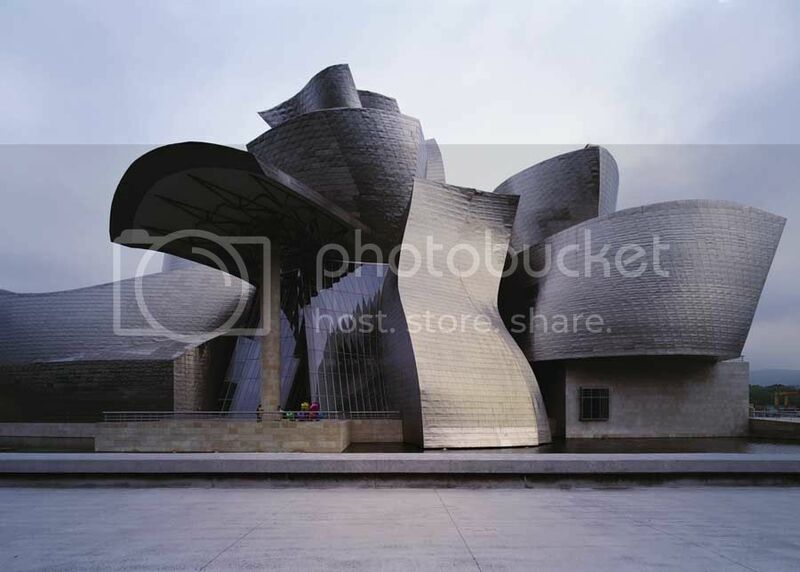 The more recent 1997 Guggenheim Museum, that in Bilboa Spain, designed by Frank Gehry, continues the debate. Here the architecture is even more radical and the artwork more subservient. So, which should be given the higher priority - art or architecture? This question continues to be debated today, although I would contend that the wrong question is being asked. Perhaps we should ask if art and architecture can co-exist? I believe that they can, and I will offer an example in which I believe the architecture actually enhances the art and vice versa. 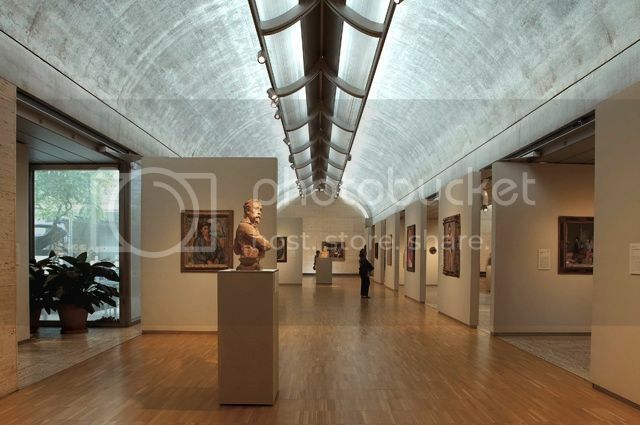 In 1972 the Kimball Art Museum, designed by Louis Kahn, opened its doors in Ft. Worth Texas. Kahn skillfully crafted a series of linear vaults which are designed to capture and redistribute the just the right amount of light in which to view the artwork. The minimalist design and spare material palate of concrete, travertine, and wood offer a non- disruptive background. When expansion became necessary a few years ago, it proved to be difficult task to find an architect who could provide an equally enticing venue in which to display art without compromising Kahn's design. 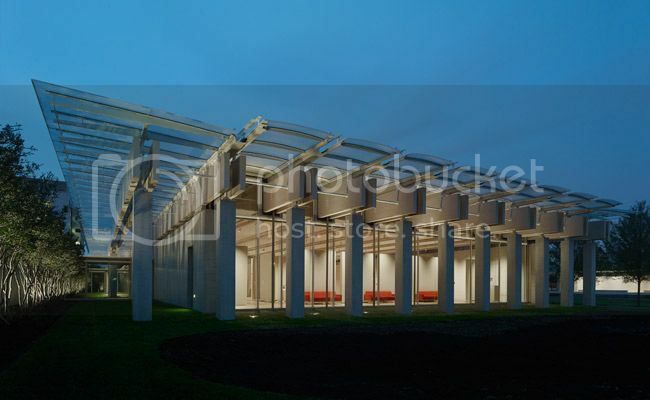 Renzo Piano's Building Workshop was ultimately selected for the commission and their addition recently opened to the public. Piano chose to build a separate building and connect to Kahn's museum through an underground tunnel. Piano's layout takes cues from Kahn, with its linear galleries and floating partitions. He also mimics the way Kahn used natural and artificial light, as well as his material choices. These building are not twins, but brothers, separated by years but sharing DNA. The result is multi-faceted. Kahn's and Piano's buildings complement and reinforce each other. Each building is architecturally significant in its own right, with a simple sophistication that also allows the artwork to shine unchallenged. As a result, artists and exhibitors love to show at the Kimball. To me, this is museum architecture at its finest. Museums are a complex building type, requiring collaboration between the architect, engineers, consultants, end users, and most importantly, the client. The connection of architecture to the client will be the topic we explore next. Join me next time for Hosanna! A Client!